The Deutsch HD10 Series is an environmentally sealed, thermoplastic cylindrical connector series and offers arrangements from 3 to 9 cavities. 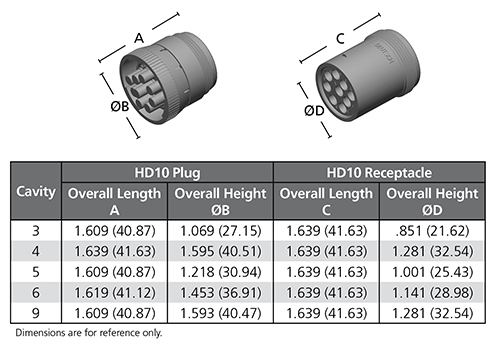 All HD10 connectors are available either in-line or flanged and accept size 12 or 16 contacts, or a combination of size 16 and size 4 contacts. The HD10 Series is heavily used for diagnostic connectors, eliminates problems associated with assembly and maintenance time, and is designed for long service life.